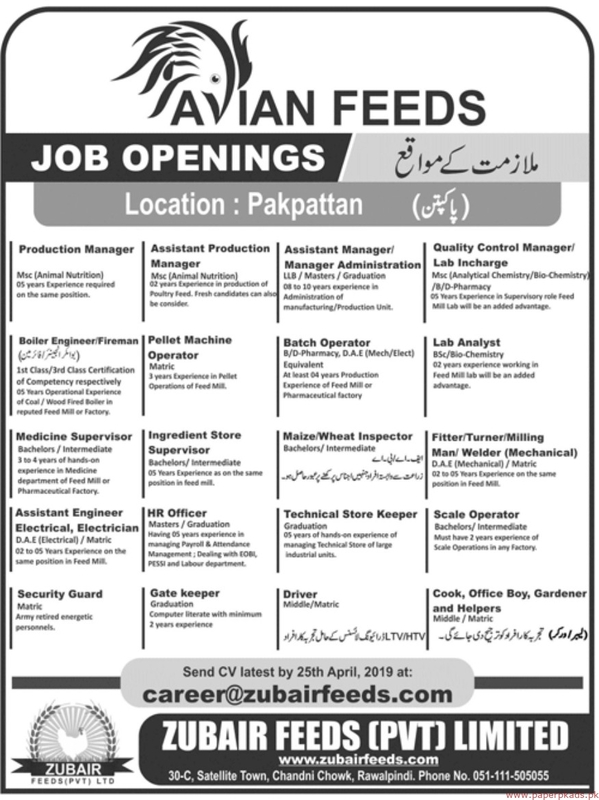 Zubair Feeds Private Limited Jobs 2019 Latest Offers Vacancies for the Positions of Production Manager, Assistant Production Manager, Assistant Manager, Manager Adminisration, Quality Control Manager, Lab Incharge, Boiler Engineer, Fireman, Pellet Machnie Operator, Batch Operator, Lab Analyst, Medicine Supervisor, Ingredient Store Supervisor, Maize, Wheat Inspector, Fitter, Turner, Milling Man, Welder, Assistant Engineer Electrical, Electrician, HR Officer, Technical Store Keeper, Scale Operator, Security Guard, Gate Keeper, Driver, Cook, Office Boy, Gardener and Helpers. These posts are to be based PUNJAB Islamabad. The aforesaid Jobs are published in Jang Newspaper. Last Date to Apply is April 25, 2019. More Details About Production Manager, Assistant Production Manager, Assistant Manager, Manager Adminisration, Quality Control Manager, Lab Incharge, Boiler Engineer, Fireman, Pellet Machnie Operator, Batch Operator, Lab Analyst, Medicine Supervisor, Ingredient Store Supervisor, Maize, Wheat Inspector, Fitter, Turner, Milling Man, Welder, Assistant Engineer Electrical, Electrician, HR Officer, Technical Store Keeper, Scale Operator, Security Guard, Gate Keeper, Driver, Cook, Office Boy, Gardener and Helpers See job notification for relevant experience, qualification and age limit information.